Eric Casaburi, founder and CEO of Retro Fitness, has an open and transparent style. He also likes to lie on a bed of nails daily to meditate, relieve stress, and, he says, help improve his decision-making. He's also routinely on Instagram, Snapchat, Facebook, and Twitter where he creates videos, shares business advice, and offers people a glimpse into his daily life at the helm of the fitness brand. 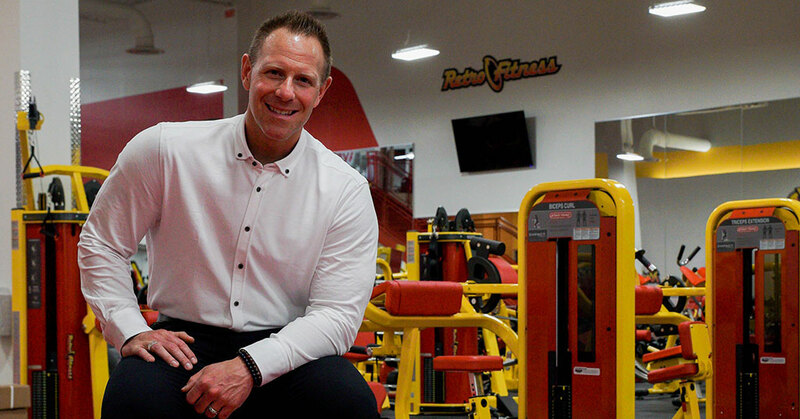 "I think this benefits franchisees and our employees because they see what goes on inside Retro Fitness leadership," says the 42-year-old. "They see who I am, what I do, and how important the success of the brand is to me. They see that I'm working just as hard as they are." Fitness has been a way of life for Casaburi, who landed his first gym job at 13. He knew he'd found his place in the world and launched Retro Fitness just 10 years later. He began franchising the brand in 2006 and now has more than 150 gyms in 16 states and another 100-plus in the pipeline. The brand, which does $150 million in annual business, is on track to have 250 gyms up and running in the next two years. Last year, Retro Fitness signed more than 20 new franchise agreements for new or emerging markets. Casaburi is passionate about healthy lives--not only his own, but also those of his brand's employees, franchisees, and clients. He believes unequivocally in Retro Fitness and sees nothing but growth ahead as people look to live longer, healthier lives. Not surprisingly, the brand is investing heavily in its digital presence and other technology to reach customers. "If we keep up our expansion efforts, which I expect us to, without a doubt we will have 700 locations by 2020," he says. Asked about his bed of nails habit he says, "My wife thinks I'm crazy, but you have to be able to put yourself in very uncomfortable places and be able to get your mind thinking right. It can really help with decision-making when you're under stress." What isn't my role? As a CEO, you have to understand just about everything. You don't have to do everything, but you need to know how to do everything so you can give good direction and delegate efficiently. I lead by example. I like to be in the thick of it, and be the first to do something so I can see how it gets done and set an example for others. I think leadership falls under how you were raised. Leaders aren't born, it's all in their upbringing. The first leaders in your life are your parents. Both of mine inspired my leadership, especially my mom, who was the head of the household. Not being able to do it all myself. We're very family-oriented and do our franchisee convention at Disney World each year--not just for franchisees, but also to benefit our corporate team. Everyone is encouraged to bring their family and we offer activities that include their entire family. This opens the opportunity for me to speak with them one-on-one outside of the gyms or corporate office. For the franchise as a whole, it's challenging. I'm extremely active on social media--Instagram, Snapchat, Facebook, and Twitter--constantly creating videos, sharing business advice and giving people a glimpse into my day. I think this benefits franchisees and our employees because they see what goes on inside Retro Fitness leadership. They see who I am, what I do, and how important the success of the brand is to me. They see that I'm working just as hard as they are. an MBA school or OTJ? Always on-the-job. I had a funny conversation with my daughter about this the other day. Her friend is taking an entrepreneurship class, and when I asked her why she didn't take it she said, "Dad, I live with you. First of all, you should be teaching the class. Second of all, how could someone be teaching the class if they're not an entrepreneur?" I'm glad my outlook is resonating with my kids. When stuff goes wrong, people typically stare at one person to point the blame. But when stuff goes right, they look at everyone. As CEO, you have to be able to deal with this and know that at the end of the day you're the one who has to make the tough decisions. I know the tough decisions are on my shoulders, so I always confer with people I think are going to add value for me--whether it's my attorneys, CFO, or VP of operations. I know where to gather the information I need to help me make a decision. Being resourceful helps me do my due diligence at light speed, so I'm able to quickly make a tough call. You have to be the one making the tough calls. I don't care about either. I want to win. I delegate what I have to delegate, and I do what I have to do. I have heads of each main department: marketing, franchise development, real estate, and franchisee relations. A majority of them have been with me for at least four years, some from our early days. We meet together each Monday and then talk multiple times throughout the week separately. This helps me get to know what's going on in each of their individual areas, which helps me make decisions. This also helps me offer my services to them. Every Friday, I send them a list of five or six questions to prep for the Monday meeting, and one of those questions is always: How can I be of service to you? Whether it's help negotiating a contract or talking to a franchisee, I always offer myself as a tool for them. A few of my favorites are Jim Collins and Michael Gerber, but really any management book within that realm is among my favorites. I'm constantly looking for ways to better myself, so I'm always reading a new management book, watching webinars or videos, and listening to podcasts each week. The answer to this question is going to change over time because as your life, career, or business changes, you always have to wake up and say that. Otherwise, you shouldn't be doing what you're doing. I love what I do and am smart enough to maximize my potential. People are more knowledgeable about the importance of being healthy and the benefits that come along with looking and feeling healthy. With this, they are wanting, able, and willing to spend more money on themselves, their health, and their fitness in so many different ways. I think they're investing in their looks and feelings about themselves, as well as the associated things that come along with it. We are seeing an increase in our personal, team, and small group training because people's spending habits are starting to focus more on staying healthy. We started Retro Fitness right in the middle of the economic downfall as a value proposition from the very beginning, so our customers didn't have to be reached. They have always benefited from our lower-cost membership. The recovery really didn't change our consumer base. They never stopped spending on their health, they're just spending it differently now and increasing how much they're spending at our gyms. The economy doesn't drive my consumer, I do. More market penetration. We're investing heavily in our digital presence to increase our potential consumer reach. We know where the attention is, and expect foot traffic into our gyms to grow significantly because of how we're attracting it. It depends if they have the money. If they can find financing, they will always add more units. My clock has no end. I have a fluid schedule. I'm ready to sit at my desk after I've slept 7 or 8 hours and had some kind of physical activity. I like to say that if you don't sweat every day like you're getting chased by the police, then there is something wrong with you. On the flip side, I'll work at my desk until 2 a.m. because I can turn back on with a quiet house and a calm mind. Exercise in the morning and sometimes in the afternoon for an energy burst. No wine at lunch, but always a protein shake or nutrition-packed drink like the ones we offer in our Retro Blends Smoothie Bar. Yes, it's always social whenever we're together because our hours are so blended throughout a 24-hour period. There's really no "outside the office." For example, I'll hang out on a Saturday with our COO Matt Schultz and we'll put in a couple of hours together. Our CDO Jason Mattes had a delayed flight the other day and grabbed dinner with our CFO Robbie Sprechman and our attorney Justin Klein. We're a pretty tight-knit group. Tools of Titans by Timothy Ferriss and God Calling by A. J. Russell, which I read daily. MacBook Pro, iPad Pro, iPhone, Apple Watch, AirPods, and sometimes my Snapchat Spectacles. One or two times a day, I lie on a bed of nails and meditate. My wife thinks I'm out of my mind, but it's unbelievable what it does for you. You have to be able to put yourself in very uncomfortable places and be able to get your mind thinking right. This will help you make much better decisions when you're under stress. They're all beaches: Anna Maria Island and Palm Beach in Florida, and Long Beach Island in New Jersey. I love everything we offer, otherwise it wouldn't be in our gyms. I live our products and services every day. Before or after every workout, I have one of the drinks we sell at our Retro Blends Smoothie Bar. My in-home gym houses the same equipment as our gyms, or ones we're testing. I regularly do our Retro 2.0 workouts. Sustain growth by continuing to expand the way we're growing now, which is healthy. We have a great franchise system that's composed of phenomenal franchisees from all walks of life. I'd like to keep growing this way and keep more people in the United States and the world healthier because we're doing life-changing things. If we keep up our expansion efforts, which I expect us to, without a doubt we will have 700 locations by 2020. Open your eyes, capital can be found anywhere. There's more money around today than ever. I'm not just referring to institutional loans. There are so many other ways to find capital these days. There's private equity all over the place dying to place money. There are people trying to diversify their portfolios because they don't want to be pigeonholed in this market. And there are individuals looking to invest capital. You need to be creative with who you talk to, who you surround yourself with, and the types of questions you ask. Do this and you will find capital everywhere. Personally, do I wake up and smile? Money is the measured component of success, like a scoreboard, but what's more important to me is happiness. Am I happy? Am I making other people happy? Is Retro Fitness healthy? Are we in a good place? That for me is success. It's the constant continued achievements. Marrying the perfect woman and having four ridiculously amazing children. I'm mindful of things I've done wrong or am doing wrong and adjust very quickly. I'm an eternal optimist, so I don't ever look at things that go wrong as things I terribly regret. I learn from them. To me, regret is for people who don't take action. For example, I could say that I wish I would've started buying shopping centers to place my gyms 10 years ago because it was a brilliant idea. I overlooked it early on because I was so focused on growing the franchise. But is this a regret? Not really, because I learned from it and am doing it today. A lot of attention. We're working on some innovative initiatives in the digital/tech space. We're partnering up with the right people in marketing and media to garner a lot of attention.